For business meetings, workshops, press conferences, social events, banquets, and weddings, Hotel de Mendoza has five event halls and a terrace to accommodate from 8 to 180 guests. The professional event staff can assist in organizing, assuring a successful and memorable event. Furniture and audiovisual equipment rentals are available, as well as valet parking and catering. All meeting rooms have individual lighting and air-conditioning. Azteca Hall: maximum capacity of 60 guests. Private Dining: located next to La Forja restaurant, accommodates up to 8 guests; ideal for small business meetings or private dining for birthdays and anniversaries. 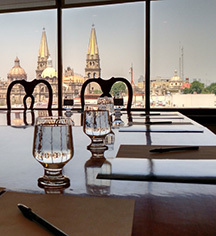 El Campanario Meeting Room: accommodates 12 or 18 guests, has air-conditioning, and an extraordinary view of the cathedral. 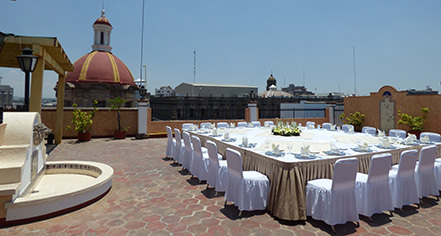 Campanario: maximum capacity of 80 guests, different room configurations available, and has beautiful views of the cathedral.